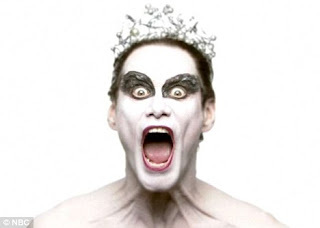 FilmLand Empire: Jim Carrey in... Black Swan! I was just asking myself that question as I came across the Black Swan SNL spoof. It is not particularly well written but thank god comedy genius Jim Carrey makes it absolutely hilarious. And then when watching it, it becomes fairly obvious what made this film stand out so much: the striking imagery, the dramas, the histrionics even... Some films are just ripe to be lambasted! It is like everybody wants a piece of the Black Swan action at the moment, just as SNL broadcasted this, Natalie Portman's body double comes out with a claim that the Oscar winning actress only did 5% of the dancing (like, who cares! ).